Dream Team VII coach Imama Amapakabo has shared his thoughts on the invitation of Francis Uzoho, Valentine Ozornwafor, Chidozie Awaziem and Victor Osimhen to strengthen his team ahead of tomorrow's U23 Africa Cup of Nations qualifier against Libya in Asaba. Amapakabo insisted that the four players originally named to the Super Eagles roster for the AFCONQ vs Seychelles and international friendly with Egypt had been part of his plans right from the beginning. ''Let me correct an impression here, the players were not dropped down,'' Amapakabo stated. 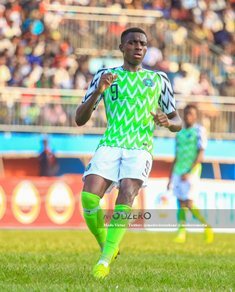 ''Myself and Gernot Rohr when we started building this team, we were always in communication, trying to see our best to give other players that have not had the opportunity of starting in the Super Eagles A Team, trying to see how best we can give them opportunities especially those within the age bracket. ''This should go down as a big plus for the nation because we have a very, very young team. This team is even younger than the team that went to the World Cup. ''We have four players - a goalkeeper Francis Uzoho, two center backs Valentine and Awaziem, and striker Victor Osimhen. ''We decided to draft these players in because from the onset they were supposed to be part of the plan because we wanted to give some other players opportunities. ''These guys are professional and are adapting very fast''. Amapakabo is confident his boys can overturn a two-goal deficit from the first leg against Libya in their 2020 Olympic Games qualifier. He added : ''We played against a Libya team without knowing too much about them apart from the fact that they play a 3-5-2 formation. ''Despite the fact that we were one-man down, we had absolute control of the game. ''Football is a game of chances, they had theirs, they had three shots at goal and were able to take two of them and we couldn't take our chances when we had four shots at goal.